I wear far too much leopard print. It's getting out of control. Leopard flares: Evil Twin. 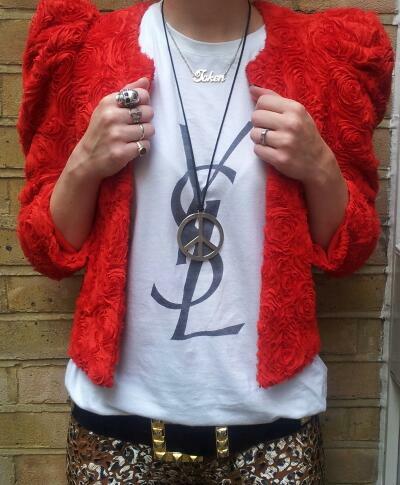 T Shirt: Stolen from the YSL Paris show from AW10 by my lovely friend Kerri. Red floral jacket: H&M (it has no shoulder pads, they just sit like that, how awesome.) Black platform boots: Topshop. Black and gold belt: This was my lovely mum's belt from years and years ago. She is so happy when she see's me or my sisters wearing her old clothes, and we are so happy to wear them!